We live in a competitive world where everyone is constantly in a rat race. Everyone is eyeing on the same position as you and the competition is tough. There are some people, who just never give up even after multiple failed attempts. These are the people, who rise and shine. The key is to never give up and keep at it. How to learn the art of never giving up? Always know that great things take time. The famous quote, ‘Rome was not built in a day’ is true in life as well. You cannot expect everything to fall in place quickly. It takes time and patience for everything to settle. 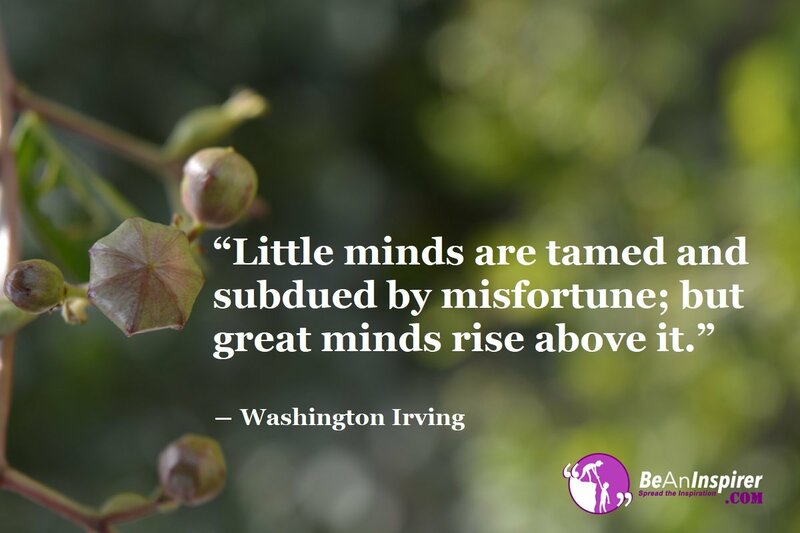 Washington Irving’s beautiful words are true! The quote literally means that unimaginative people give up too easily but great minds rise above the failure and they never stop working towards their goal. If the whole world would give up, we would not have great minds! Wise people keep going on and they overcome their misfortunes. When you give up too easily, it means that you are not prepared to enter the real world. You cannot be in your own bubble of ignorance! You have to accept that failure is a part of life and it does not make you a failure in life! Small minds get consumed by all the difficulties of life. They are too obsessed with the problems in their life that they forget to work on the solutions. If you wish to learn the art of never giving up, you must have a positive thought process. Small minds get overwhelmed by the difficult that are there in life. Have you ever thought about people living on roads without any shelter or food? Have you ever looked at animals that have no source of food or water? These people have no choice but to stay positive! We should be thankful that we have a roof above our head and basic necessities of life. We think too much about our problems but we forget that there are people who are living in worse conditions. Great minds know that difficulties are a part and parcel of life. They overcome these difficulties with a positive attitude. They never give up because they have a positive thought process. Great minds are solution obsessed and small minds are problem obsessed. Great minds are bigger in stature because they overcome the difficulties beautifully with their positive attitude. Even after multiple failed attempts, their hope and will does not shake! Additionally, they find opportunities and also a silver lining in these difficulties. Focus on the silver lining and not the endless problems in your life. You are not the only one who is facing difficulties! Learn the art of never giving up and you will convert all the difficulties into opportunities!